This weekend I took a trip to Morocco. It was with a student excursion company called ‘European Vibe’. It was €199, this included travel, two nights in a hotel with breakfast and then a traditional three course Moroccan meal. Thursday 20th November We’ll meet Thursday at 22:15 at Plaza de España. The exact meeting point would be at the Plaza, right across the Starbucks Cafe (remember, if you are waiting outside Starbucks, you are in the wrong place, you need to cross the street towards the square). There we’ll catch the buses that will take us to Tarifa. The bus departs at 22:30 so punctuality is a must. Friday 21st November At around 7:30am we should be getting to Tarifa (depending on traffic conditions). Once there, we’ll jump on the ferry to Tangiers where we’ll have to go through customs. Once in Tangiers we’ll walk to the coach parking lot and start the trip to the hotel. On arrival at the Chellah Hotel you’ll need your passports ready. After checking in you’ll have some free time to rest and walk around the local bazaar. Then, time to visit some tourist sites and camel rides so don’t forget your camera!! Saturday 22nd November9:00 a.m. SHARP meet at the hotel lobby to start our guided walk around the ancient Tangiers Kasbah (old town). Following this tour we’ll board the buses for the excursion to Asilah – the most beautiful Moroccan coastal town in the area. This town is full of art and locally made products, a good place for finding a unique souvenir. Sights include the 16th century center with its fortifications, the white washed traditional architecture adorned with murals painted by local and visiting artists. The journey time back from Asilah to the hotel is approx 1 hour and we should arrive at approximately 17:00. Free time, maybe for some more local exploring and shopping. At 21:30 to 22:00 meet at the hotel lobby for an escorted evening to local bars and the sea front clubs (optional), there is no cover to get in but you will be required to buy a drink inside, most likely you’ll be able to hire a Hookah and they are usually shared between 3 to 5 people. If you have any questions or concerns, please ask one of the European Vibe Travel representatives. Our group leader, Jorge, was fab! Kept the trip organised and made us laugh! Our tour guide once in Tangier was nutters! He was called Rashid. He told us of his 4 wives and all over crazy stories! He definitely kept us entertained on the coach trips. Tangier was a really cool place! Just like any other city. It has shops, hotels, bars and restaurants. However, when you delve deeper into the streets and look further, it is the weirdest place I have ever been to! It’s crazy how different they live. No modern housing estates or big supermarkets. Everything seemed really run down and dirty. It was great to see a different culture and way of life though. On the first day, we were sooooo tired from travelling, but we napped at our hotel, Atlas Almohades, before being taking round a coach tour of the city. We were shown various different religious buildings and key parts of Tangier. We then went to the beach to ride camels. It was actually quite scary getting on and off and they’re so much taller than I thought. We got a ride for about 15 minutes though! So much fun! We visited a rug shop where a few men worked to create homemade rugs. They were all so pretty but not in my budget! I took their card though so if I want one anytime soon, they can ship it to me. The men who worked there also allowed me to take their portraits which I was really happy about. We visited a garment shop too. Their were traditional Moroccan garments that could be tailor made and also many scarves of all different colours. Walking in the shop, there was a man using a machine with his feet that created allowed the thread to be flung across, slowly piecing together a piece of material. It was so fascinating to watch, and I couldn’t get my head round how it worked. Assilah where we took an afternoon trip to I found to be much more traditional. It is a fishing town about an hour away from where we were staying in Tangier. We got some food before we went to explore. There was a few market stalls which is what I had been looking for. I have always wanted to visited a traditional Moroccan Market. I wanted to experience the whole ‘barter’ technique and buy some homemade goods. However, I didn’t really find much here. i’m so glad I went on this trip! I met some really cool people and had such a laugh! I am definitely going to keep in touch with them! 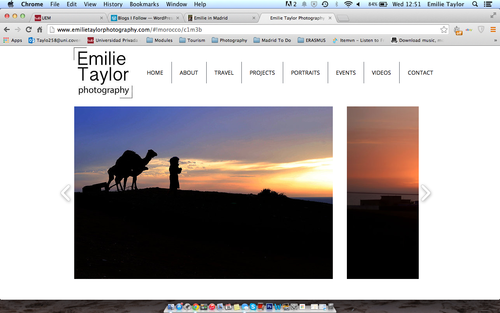 I was able to add to my portfolio which was my main reason for going and am soooooo pleased with the results. I have had some amazing feedback 🙂 I am going to visit Morocco again in the summer and visit Marrakech as I know it will be a completely different experience.